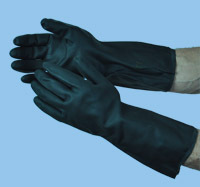 Suitable for numerous chemicals and solvents. Textured, microrough surface, with excellent resistances. Inside cotton flocked. 100 pairs in shipping carton. 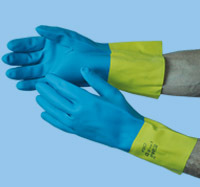 Dipping and cleaning with protection up to the elbow. 40 % thicker than NITRIL GREEN. Inside smooth, washable. 36 pairs in shipping carton. 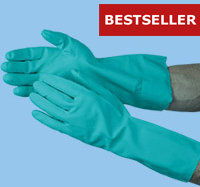 Suitable for numerous chemicals according to resistance table. Grippy, textured surface. 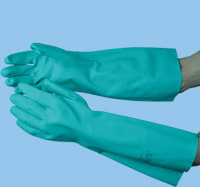 Multi-use glove, watertight, resistant against usual cleaning suds, diluted acids and alkaline solutions. 144 pairs in shipping carton.